A call has been made for Hounslow Council to re-run a public consultation on its ten-year Library Strategy. Local Conservative councillors have described it as “a sham” because it was held over the summer holidays and had a low response rate. Councillor Liz Mammatt, Conservative Deputy Group Leader on the Council said the public needed to be aware that libraries were under threat. “No wonder the response was so low, just 228 replies out of a population of 254,000 in 2011. Ward Councillors had not been informed. Furthermore a consultation paper on Council Tax Benefit was being held simultaneously with a similar front page so the Libraries’ one was not distinct”, she said. Her views were backed by Chiswick councillor John Todd, who said that the final question in the consultation needed to be highlighted. It deals with the option to “re-locate library sites” , which local councillors say can be taken to mean “ closure”. Recently Cllr Sachin Gupta, cabinet member for communications and communities on the Labour-controlled Council, said that the Conservatives were twisting an important and what he described as a well-publicised consultation for the sake of scoring a political point. "We've made it very clear that we are not closing libraries or reducing their opening hours. In fact we recently refurbished several sites and invested in upgraded IT and computers. It says so in the consultation. "We want to put libraries at the heart of the local community, and far from trying to push through 'unpopular changes' as Cllr Mammatt implies, we're asking library users for their views on how we're planning to improve the service for the future. Many of our proposals come from what communities have told us they want at libraries." 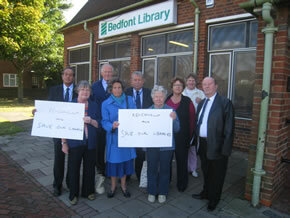 Councillor Mammet said that libraries in Bedfont, Cranford and Osterley were salvaged last year through public opposition. “Libraries are a hub of the local community, providing educational facilities, the internet for those seeking jobs, doing research and applying for housing as well as a resource for pensioners. They are an accessible venue for activities such as book clubs, craft fairs, lectures, residents’ meetings and groups of different interests. Everyone should be alerted to this vital consultation which should not have been surreptitiously slipped through during the quiet season,” she declared. A message on the Hounslow Council website states that the consultation has now closed. Last September Hounslow Council announced plans to cut its book budget for libraries by 40% to save money. The Council’s draft strategy for the borough’s eleven libraries, including Chiswick, reduced the book fund from £570,000 to £ 333,000, a saving of £ 240,000. The Council said last year that its savings target for 2011-2012 and beyond was £500,000 and this could be achieved with “ limited impact” on library services. Using John Laing Integrated Services (JLIS), who hold the contract for staffing, building maintenance and other services, a saving of £1.2 million had been made over three years.